Answer: Today I'd like to discuss planting moss in terrariums. TL:DR Answer: I recommend rinsing moss with water, tearing it into smaller chunks, and planting it in the soil. Nesting Ranch, it looks like you placed large swatches of moss directly on top of the soil in some of your terrariums rather than splitting it into smaller chunks. Yes, I know some people say that works. Yes, I know some terrariums appear to have moss planted that way. But in my experience, it takes some prep work to give moss a fighting chance in your terrarium. 1. Wash your moss. The gist of it is - rinse your moss out with some water and remove any trash or over sized pebbles etc. 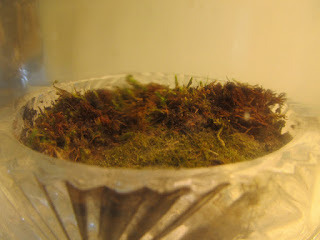 By rinsing the moss you are "waking it up" a bit and getting the root parts more exposed. Read more about washing moss here. You may also consider putting the moss into a holding zone to observe its overall health prior to planting it in your terrarium. Is it going to go brown in 48 hrs? Are gnats going to appear? 2. Tear the moss into smaller bits. This advice is based on personal discovery based on trial and error. I never had luck plopping a chunk of moss onto soil in a terrarium. I find smaller pieces nestled into the soil (i.e. "punched" into the soil with a chopstick) tend to flourish more frequently in the long run. And of course, moss needs humidity. If you are using an open top terrarium, put a lid on it!